The Philbrook’s much-admired and long-tenured Director was retiring after overseeing a period of great change. The Board had been deeply committed to the Director, but it had, first and foremost, great allegiance to the Museum. The Board was also a confident, collegial body excited by the prospect of working with a new leader. Although they wanted fundraising and managerial experience as well as personal skills, the Board was also open to up-and-coming talent whose energy and contemporary view of the museum profession would take them in new directions. In this search, in addition to people already serving as directors, Opportunity Resources made a special effort to dig as deeply as possible nationally to uncover museum professionals whose experience identified them as the next generation of museum leadership. We focused on department heads and deputy directors in museums with large budgets and large staffs. Brian Ferriso, the successful candidate, was the Senior Director of Curatorial Affairs at the Milwaukee Art Museum, and had been appointed Acting Director during the Museum’s search for a chief executive. When Brian was recruited away from the Philbrook as Director/CEO of another museum, we also successfully completed the search for his successor. Once again, the Board was open to strong young talent. Randall Suffolk, the successful candidate, had 11 productive years at The Hyde Collection, a highly-respected art and house museum founded in 1952 in Glens Falls, New York. Rand had been hired as a curator and quickly promoted to Deputy Director and then stepped into the Director position just four years after his arrival. Under Rand’s tenure, attendance increased 65% and membership 41%, and the Board also evolved to represent and serve a regional audience. Since arriving at the Philbrook in 2007, Rand led nationally-recognized initiatives to integrate the museum with the surrounding community and forged partnerships at regional, national, and international levels. 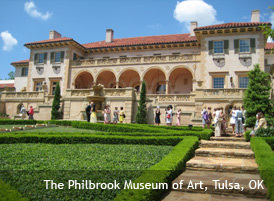 Under his tenure the Museum’s satellite space, Philbrook Downtown, opened in Tulsa in 2013. Rand was recruited away in 2015 to lead the High Museum of Art in Atlanta.